Welcome to Poor Ash’s Almanack, the best free mental models resource on the internet. What’s a mental model and how will it make you better at life, business, and pretty much everything? If you don’t know the answer, that’s okay – start here. Follow in these readers’ footsteps and turbocharge your happiness and productivity by exploring our three types of content and joining our mailing list (below) for infrequent, thoughtful nudges to make wiser decisions. 100+ important concepts that’ll make you dramatically more effective at life, condensed into 37 pages that are easy to read and understand. Some of my favorites: structural problem solving, culture / status quo bias, cognition / intuition / habit / stress, luck vs. skill, and salience. Not sure what to read next? Our book reviews provide detailed insights on what you can expect to learn from any given book – and our notes and analysis highlight the mental models, tying in related concepts from other books to enrich your learning and provide you with logical next steps. If you’re feeling overwhelmed, I’ve put together a few suggestions on how to group content in a thematic manner. 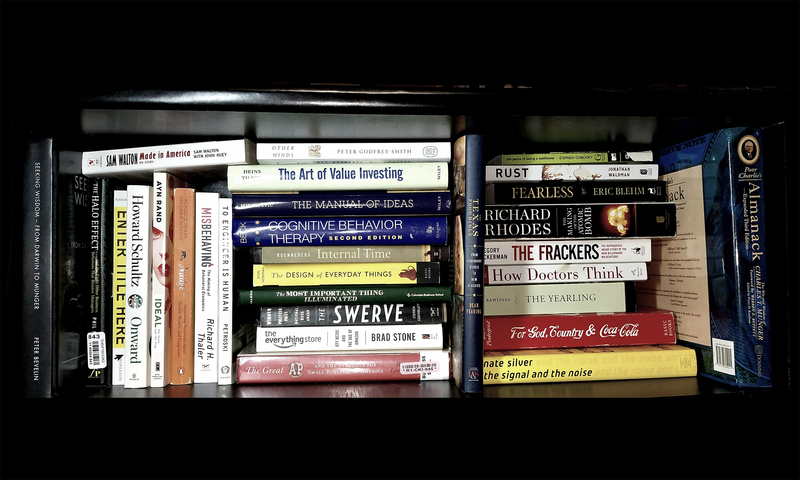 The most useful is probably the 80 / 20 Mental Models Learning Journey – 17 books in 17 weeks to get you through 80% of the value on this site. Are you, like many other high-caliber thinkers – incl. managers at $1B+ AUM shops – subscribed to our mailing list yet? If not, you’re losing out on occasional “nudges” to get wiser! Below are links to pages containing 100+ critically important mental models I’ve gleaned after years of reading hundreds of books. I’ve condensed them into 37 highly interlinked pages, because association enhances learning, and because the models are more powerful when they’re interacting. “I’ve long believed that a certain system – which almost any intelligent person can learn – works way better than the systems that most people use. What you need is a latticework of mental models in your head. And, with that system, things gradually get to fit together in a way that enhances cognition. Lots of people talk about mental models; few have built an actual latticework. It’s easy to see why: building this latticework – comprising over half a million words in total – was the hardest thing I’ve ever done in my life. And I’ve done some pretty hard things. No kidding on the “too-hard” pile. Nothing substitutes for your own reading, thinking, and application. But I hope this latticework of mental models – spanning the models, their interactions, and many of the books in which you can find them – makes that hard work a little easier for you. This mental model is where you should start if you’re not familiar with the mental models approach – it covers sub mental models like man-with-a-hammer, circle of competence, and mapmaking, helping you to understand exactly what you are trying to accomplish in the process of enhancing your cognition. When you’re sleep-deprived – like 70% of adults and anyone who wakes up with an alarm clock – you may be the equivalent of “legally drunk,” and neuroscience finds your prefrontal cortex – the home of rational decisionmaking – may be in an “offline, disabled state.” Sleeping 8+ hours a night – at the right time of day, as determined by your individual genetically-determined chronotype – rather than society’s demands – is critical to your productivity and health. Very few people have a full understanding of how our decision-making process actually works. It’s critical to understand the disparate (but interlinked) systems of cognition and intuition, how the former modifies the latter via habit/conditioning, and how stress can dramatically distort our decisions – plus, of course, how we can combat that amygdala hijack, both in the moment (short-term) and through longer-term approaches to life. Many brilliant thinkers point out that much of what we do has no fundamental purpose or prevailing reason. Much human activity, on the contrary, is shaped by “status quo bias” or “culture” – our tendency to do what we (and others) have historically done. This is generally adaptive, but can lead to some crazy outcomes. Understanding sub-models like default options and opt-in vs. opt-out can help us make more effective decisions – and “nudge” others to do the same. It shows up in many contexts – understanding the sub-models like fundamental attribution error, the planning fallacy, and desire bias can help us avoid bad decisions. Meanwhile, by inversion, shifting to more of a cautious, scientific thinking process can also enhance our cognition. Everyone’s heard of the “confirmation bias” mental model, but few people actually understand the important psychological and neurological mechanisms that underlie it. Before we ever even perceive information; our brain automatically filters out some of it (selective perception) – which can be dangerous; pilots have missed planes on runways and radiologists have failed to notice missing clavicles in X-rays. Once whatever’s left gets to our brain, we actively filter out some of the rest of it – using our schema, or worldview. It’s critically important, then, for us to make sure we have a worldview that avoids ideology and lets the right stuff through while keeping the wrong stuff out – while also developing structural solutions to prevent missed perceptions. Humans do not like things being taken away from us. The esoteric, technical scientific jargon for our behavior when we’re deprived of something we believe we have a right to is “batsh*t ! @#$ing crazy.” Charlie Munger calls it the deprival “super” reaction tendency because it can even trump incentives. We’re biologically wired to notice changes – but only above a certain threshold. Those below this threshold might fly below the radar – to our detriment – unless we do something about it. Contrast bias drives sub-models like self-justification (the process by which we rationalize our bad behavior) and anchoring (our tendency to make judgments in relation to already-known quantities). An interaction between contrast bias and mindfulness is also an easy, scientifically proven way to make ourselves happier. Stuff that sticks out vividly in our minds – and thus is more “available” to our cognitive processes – disproportionately drives our decisions, for better or worse. Understanding how these related cognitive biases of salience, availability, and recency work can help us enact structural problem solving solutions that ensure more accurate information is available to us for making decisions. It can also help us communicate more effectively with others, by conveying information in a way that they’ll remember. Our memories have hard biological constraints that we cannot escape – yet we frequently, and foolishly, rely on them for critical short-term and long-term functions. One of the greatest lies of human existence is the myth that if we don’t feel like doing something today, we’ll magically feel like doing something tomorrow… or this time next year. We experience life as a series of moments, thus dramatically overestimating our self-control and willpower at future points in time, and dramatically underestimating how much specific circumstances (like hunger, exhaustion, stress, arousal, or craving) will affect our decisions. Understanding this “present bias” mental model allows us to make better decisions – as both individuals and organizations – that maximize our long-term utility. When we purchase a product or service, we only get to consume that product or service – not the irrelevant “packaging” we’re just going to throw away. Yet we often let this irrelevant “packaging” – like someone’s appearance or educational background, or whether something looks like what we expect or want it to look like – distort our cognition by substituting for the real “product” information that’s important. Sub-models include busyness vs. productivity – hard work, it turns out, is not only not always effective, but sometimes it can actually kill you – as well as precision vs. accuracy, which explains a lot of low-utility professional activity. There’s no use crying over spilt milk – but we do anyway. Perhaps no tendency of human cognition is more paradoxical and destructive than our penchant for throwing good after bad – wasting precious time, money, and emotional energy trying to “get back” past expenditures which simply cannot be recouped. This tendency is powerful, particularly when it interacts with other models like incentives – as we’ll see, it can even lead honorable and upstanding citizens to kill innocent civilians and then celebrate their deaths, even though we have no justification for doing so. We tend to jump to absolute conclusions on the basis of limited data; this leads us to make decisions based on beliefs that can’t be justified by rational analysis. Thankfully, there is a counterapproach – albeit a nonintuitive one: probabilistic thinking. Becoming a “many-handed economist” and starting to say things like “it depends” and “it could be that, but it might also be” isn’t going to score us any points with friends (or employers), given humanity’s desire for certainty. But if you want to make effective decisions, probabilistic thinking is absolutely crucial. “Belief behavior matters” is one of the foremost data-backed predictors of professional success and emotional / personal well-being. Determinism and nihilism should be uniformly rejected by any rational thinker in favor of agency – the belief that we have control over our future, that no matter what happens, we always have the power to choose our response. One important sub-model is the “growth mindset” – treating failures as an opportunity to reflect, learn, and bounce back stronger, rather than succumbing to defeat and learned helplessness. Too much of a good thing isn’t always better, though – some immature and irrational people advocate “willpower” (sometimes known as “grit”) as the solution to all of life’s problems, despite the fact that research indicates that willpower is usually the least effective way to solve any problem. Peer pressure ain’t just for teenagers – decades of rigorous research demonstrate that humans have a powerful need for social connection, which in turn drives our tendency to do things because other people are doing them. This tendency is often subconscious, but is an extraordinarily powerful mental model that can turn our brains into mush: many intelligent, rational people will pick an obviously wrong answer to an easy question if everyone around them is doing so. Important sub-models here including the “liking bias” and “reciprocity bias” – when we like people, or when they do nice things for us, we tend to view and treat them more favorably than we otherwise would. This has clear applications for professional success: make other people like you, and the world is yours. But be mindful that others can exert this same influence on you, too. The drive to be understood is so powerful that the simple act of listening to a friend discuss their challenges can dramatically boost their mental and physical health – per scientific research. In a professional context, empathy is equally important as well: solving problems (whether our own, or those of others) often requires us being able to see the world from another person’s point of view – even if we disagree with that point of view. Why do many of us go through life unhappy despite a constant stream of enjoyable experiences? Why do many of us find it difficult to abandon cherished beliefs, even as mounting evidence demonstrates their lack of validity? Answers to these questions can be found in the practice of mindfulness; I personally use a less passive, more “active” / aggressive approach called “cognitive behavioral therapy.” Sub-models here include “hedonic adaptation” – the tendency of our emotional well-being to remain at a relatively stable baseline (over the long-term) despite positive or negative external circumstances – and specific, psychologically-validated approaches for more accurately processing the world, and feeling happier to boot. What’s the easiest way to deal with a problem? Don’t have the problem in the first place. This approach should be intuitive to many people – it’s an underlying principle behind everything from oil changes to contraceptives – but altogether too often, as individuals or organizations, we stubbornly try to willpower our way to success, moving sand from here to there with our bare, bleeding palms rather than doing the smart thing and renting a bulldozer. Asking, demanding, or begging people to make good decisions in a bad structure is like asking your neighbor’s Chocolate Lab to guard your steak – it’s just not gonna work. In contrast, powerful results can be achieved using “choice architecture” to create systems where people are influenced – subtly or not-so-subtly – to make the right choices. Structural problem solving, as we’ll explore, helped people retire with 10x the savings they would otherwise have had, without making a single lifestyle sacrifice along the way. The world looks pretty linear up close – but, just like we live on a sphere that looks flat from our vantage point, many of the phenomena we interact with on a daily basis are profoundly nonlinear in nature. We can’t deal with this nonlinearity mentally, and often abstract it into an easier-to-understand linear framework. Specific sub-models include dose-dependency – more of a good thing is not always better; in many cases, like Tylenol, it can be much, much worse, or even deadly. Critical thresholds are also important – sometimes nothing interesting (or dangerous) happens until you hit a certain point, and then bam – nuclear explosion. Exponential growth is also very hard to intuit, but has important implications for our decisions as individuals and organizations. Finally, power laws underlie much of biology and society, and are an intriguing (rarely-studied) area to explore further. Like many people, I used to have a naive conception of the world based upon strengths and weaknesses that I viewed as absolute – I’m good at X. I’m bad at Y. The truth is that strengths and weaknesses are always context-dependent: what makes a company the dominant industry player of its era can (and often has) led to challenges when the environment changes. Observable in nature / biology as well as the world we’ve created, trait adaptivity is critical to understand for three reasons. First, today’s strengths can be tomorrow’s weaknesses. Second, by selecting “for” one trait, we often unintentionally select “against” others. Third and finally, how do you beat LeBron James? By playing anything other than basketball – understanding your traits as an individual (or organization) is critical to “game selection” and thus success. The more perspectives from which we approach a problem, the better our chances of finding a solution. Often, starting with the end and working backwards can yield new and unusual insights not available by working forward. Two specific sub-models here are selection bias and survivorship bias – often, when we evaluate data, we’re only seeing a small fraction of the actual sample size. By working backwards from the present set of data to that from whence it came, we can make better and more accurate decisions. You get what you pay for – it is hard to convince someone of something when their salary depends on them not understanding it. This pops up literally in many contexts throughout the world; incentives are easy to understand but phenomenally powerful. We like to think of the world as neat and simple; the reality is that it’s complex and nuanced. Just because two things often happen together doesn’t mean there’s any causal relationship; moreover, we often “satisfice” for one cause of a given phenomenon, when in reality there may be more than one – whether we’re talking about structural failure or a medical condition. Mr. Anderson’s talking about the delicate balance between remaining open to new ideas – necessary for progress – without letting our heads fill up with junk and nonsense. It’s a tricky proposition. Thankfully, there’s an approach – Bayesian reasoning and “priors” – that allows us to bridge this gap, either qualitatively or mathematically. Oftentimes, we make decisions only based on the “inside view” – the view of the world we can see from where we stand. Combining “base rates” with the aforementioned Bayesian reasoning can be a powerful decision tool – yielding completely nonintuitive outcomes about how much (or how little) to react to incremental datapoints. I’m fond of deconstructing all the reasons why hard work is overrated. One of the key ones is that in certain types of games – known as “zero-sum games” – for one person to win; another person has to lose. Think of predator and prey: for the lion to eat, the antelope has to perish. These sorts of games often turn into “arms races” – a mental model for situations in which each side works harder and harder but receives absolutely no benefit for doing so. Key to reaching this understanding is appreciating the dynamics of absolute vs. relative skill – even as we get better and better at a given task, if our competitors are getting better too, our “relative skill” – i.e. the difference in ability between that and our competitors – may narrow. What’s the solution? Win-win games – where one person doesn’t have to suffer for the other person to succeed – are much easier to win at, and yield much more positive outcomes for everyone. Every dollar, or unit of time, that we spend on X is one that we can’t spend on Y, Z, or the rest of the alphabet. A powerful decision tool is thus to be aware of a small set of the best “opportunities” available to us – whether for financial capital, time, or emotional energy – and ruthlessly compare every opportunity that comes along against that one. It’s a powerful mental model, and one that too few people apply despite knowing the concept theoretically. Everyone learns about “silos” in business school, but few people fully appreciate the real-world applications. Often, individuals and organizations face tradeoffs (discussed above) with respect to time, or with respect to a certain segment of their lives (or organizations) at the expense of the rest. For example: if you want to be happy, at any given infinitesimally small moment, the best thing you can do is take a near-lethal dose of hard drugs. That’s “local optimization.” It is in obvious and irreparable conflict with “global optimization” – the more sensible goal of having a happy life, over the long term, for which end taking hard drugs is possibly the absolute worst decision you can make. Usually the choices aren’t this clear and dramatic: but many businesses forego long-term investment opportunities to maximize this quarter’s earnings, and many individuals make decisions (with regards to friends, career, and otherwise) that are pleasant in the short-term but carry long-term consequences. It’s a mental model always worth considering. Actions have repercussions – and you have to consider those repercussions, those unintended consequences, whenever you make a decision. For example: what could be more desirable than paying doctors based on performance, measured by whether or not their patients get better? It certainly sounds better than paying them based on the number of procedures or tests they do – which incentivizes volume, not utility – but on the other hand, by inversion, if you’re paying doctors for patients getting better, you’re also not paying, or punishing, them for patients not improving or getting worse. This, paradoxically, might lead doctors to engage in the sort of “selection bias” we previously discussed – i.e., refusing to treat the sickest or most challenging patients, who arguably need medical care the most. This mental model shows up everywhere. Sub-models include reflexivity and network effects. Systems respond to feedback – but only in certain forms. If feedback is inconsistent, unclear, or unavailable, strange outcomes can emerge. That, of course, leads to more stress – which leads to hitting the bottle even harder – which leads to more stress. Thankfully, this sort of process can be inverted, and used to form positive “flywheels” that spin faster and faster with their own momentum as time goes on. Decision journaling also eliminates hindsight bias – discussed earlier in the “memory” mental model – thereby allowing us to receive more accurate and appropriate feedback. What could be simpler than the mental model of doing things that are good for us – whether measured in dollars, units of happiness and joy, or otherwise? It turns out that many people fail to consider utility in making their everyday decisions, and if they do, they focus on irrelevant “packaging” rather than useful “product.” For example, consumers are often disproportionately influenced by “transaction utility” – the quality of the deal – and a “good deal” can lead us to purchase things we don’t want and won’t use, while a “bad deal” can prevent us from consuming experiences that will provide us great joy. There aren’t a lot of free lunches – but activation energy is one. Profoundly modest and seemingly unnoticeable increases or decreases to the energy required to engage in a certain behavior can have profound impacts. For example, making healthy foods merely a little bit easier to reach – and unhealthy foods merely a little bit more difficult to reach – can dramatically improve our eating patterns, without preventing us from making bad food choices if we want to! It’s not just about our waistlines: activation energy can be used to save lives and help people save for retirement, as we’ll explore. Oftentimes, the performance of an entire system can be derailed by its weakest link. If you have a flat tire, it doesn’t matter that 99% of your car is functioning fine – you ain’t getting anywhere. This applies to mindsets as well as physical systems: often, the way we see the world can be a “bottleneck” between us and success. This isn’t something that education and intelligence exempt us from, either – as we’ll explore, even Nobel prize-winning nuclear physicists faced bottlenecks in their schema. You still here? Because I saved some of the best models for last. It’s important to differentiate between luck and skill when evaluating outcomes. If you drive across the country three times not wearing a seatbelt, going double the speed limit, and live to tell the tale, you’ve learned some profoundly maladptive lessons. Particularly in cases like this where bad outcomes are infrequent but severe, focusing on a validated “process” (wearing your seatbelt) helps us make the right decisions, when “outcomes” (like not dying) can mislead us. Important sub-models here are sample sizes – what they do for us and what they don’t – as well as path-dependency, or the way that luck can accumulate over time in a manner that’s dependent on previous events. “Why won’t they read (the instructions / consent form),” moans every engineer ever – and, for good measure, South Park’s fictionalized version of Steve Jobs. Well, the answer is: we don’t read the instructions, or the consent form, because we’re humans, not econs. We’re not omniscient. We don’t have unlimited attention. And we certainly don’t have unlimited willpower. In fact, if you want to apply a margin of safety (see below), it’s probably best to assume that we have no willpower whatosever, and the attention span of a toddler who’s been given a free espresso while Mom wasn’t looking. Funny? Sort of – it can be tragic, too. When we design products or systems for idealized, fictional “econs” rather than real, messy “humans,” things can go south in a hurry – and good design will always taken into account the reality of humanity, not the way we would like humanity to be. You can take the boy out of value investing, but you can’t take the value investing out of the… never mind, that sounded better in my head. Well, I am a value investor, after all, and our patron saint concept – margin of safety – was shamelessly stolen from engineering. But, like many mental models, margin of safety is applicable far beyond its original concept and purpose: putting a whopping margin of safety between us and bad path-dependent events is one of the easiest ways to live a happy and successful life.